ARDMORE LIBRARY: Save the Date! Save the date for a fabulous afternoon visiting kitchens on the Lower Main Line! Tired of sitting in front of your computer to find new and interesting kitchen design elements? Come on the Tour to see newly renovated kitchens up close and personal and talk to the contractors on an informal basis. 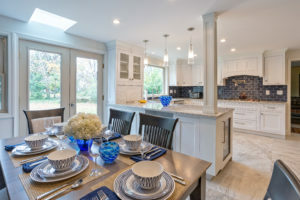 Several of the homes will have delicious tastings from local restaurants so guests can enjoy a quick bite in between touring the kitchens. Raffles will also be available on the day of the Tour just waiting for your lucky number! All proceeds from the Annual Kitchen Tour go toward purchasing books for the Ardmore Library. This is a great way to show your support to help keep our local Library strong. Visit this web site often for updated information. Online ticket sales are available! A mail-in form is also available: please see the Buy Tickets page for more information. On the day of the Tour, tickets may be purchased at the Ardmore Library with cash, check, or credit card, beginning at 11am. The unique opportunity to tour some of the Main Line’s most beautiful kitchens would not be possible without the support of our sponsors. A special thanks to all. Please click here to become a major sponsor or advertiser. Don't miss out on this opportunity... It comes but once a year!